Here: instagram.com/iamwaterlily and Follow my blog with Bloglovin! For a long time until last week, I've been planning of putting my old cellphone to rest. Well, it already served me for more than a year. It still works fine but the down side is, it's not an android one and apps/games/support are getting fewer and fewer for that unit. The unit I wanted is Samsung I8190 otherwise known as Galaxy S3 Mini. I already inquired to some outlets inside malls but it costs too much! Price range inside malls: 14k-16k php! Fortunately, this unit is also available in an online store---"Kimstore"--- that is so popular among the gadget lovers. They offer the same quality gadgets at a much affordable price! I don't remember where I first heard of this store, but since then, I've been stalking their Facebook Page for price drops and new products. Transact with Kimstore's (or any other store's) official account ONLY. Scammers create accounts under Kimstore's or Kim Lato's name. Do not be fooled. Their official account has 100k+ followers already. When an account using the same name adds you on FB, ignore. Text/call their official numbers posted either on their FB page or Multiply page. Read others' feedback on their wall! The unit's cost is 12,600php + 371php for shipping. It was delivered by Mr. LBC and the item was in a bubble wrap. lols. I am happy that it only took a day for the item to arrive. With that, I highly recommend Kimstore for your gadget needs! Thank you, Kimstore! :) Till our next transaction. Very nice gadget but there are a lot of local mobile brands Android phones offering great specs at affordable price. nice new fone! i have my iphone 3gs too for so long now! and I guess i needed one too very soon! it keeps on dying on me. the service of that store sounds amazing! good for you! I haven't tried buying gadgets through online stores. But based on your experience, I'm willing to give them a try since you got your package in one piece and in good condition. Nice buy! Would love to get my hands on it, but I don't think I'll be getting a new phone. Nice buy sis! 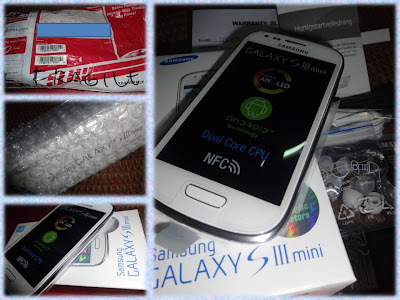 I wanted an S3 mini before, but since I got a Galaxy Ace Duos na, I'm already satisfied :) Anyway, glad you shared those tips. They'll really be helpful especially for people new in online shopping.